For the fifth year in a row Tryon, NC luthier Jay Lichty has donated a handcrafted instrument for the annual fundraising raffle by LEAF Community Arts Programs. This year�s raffle features a Lichty tenor ukulele with a unique story. 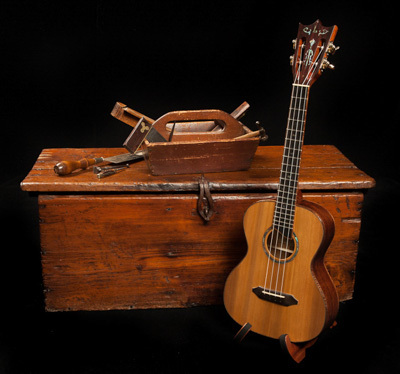 It is crafted primarily from salvaged materials; oak from the floor of a Carolina mountain cabin, sinker cedar reclaimed from a bog in western Canada and Honduran mahogany carved down for the ukulele neck from an antique bedpost. Much like LEAF�s mission to connect cultures and create community through music and arts programs locally and globally, this unique ukulele connects �wood cultures� from around the world into a harmonious community of sound. ▪	LEAF now operates the Easel Rider, a mobile art lab, owned and previously operated by the City of Asheville�s Parks & Recreation Department. The Easel Rider serves over 5,000 individuals per year. 100% of the raffle funds raised from the annual raffle will go towards LEAF programming. Retail value of this instrument is $4,135. Raffle tickets are $10 each and may be purchased via phone at (828) 686-8742, online at TheLEAF.org (online sales include a $5.99 processing fee) or at the LEAF Festival. Total annual ticket sales are limited to 500 and the winning ticket will be drawn at the fall festival in Black Mountain, NC on October 19th. The winner does not have to be present. �	Learn more about LEAF, at http://www.theleaf.org.